In 2015, a friend preached the gospel of Almighty God to me and I accepted it. After I knew Almighty God’s work of salvation in the last days, I read His words eagerly. My husband said to me, “It’s better for you to believe in God and read books than watch South Korean dramas every day. I’m happy about it.” As my mother-in-law was a believer in the Lord, my husband believed that there exists God and supported me to believe in God despite his not attending meetings. When I received enlightenment from God’s words, I shared it with him and he thought that belief in God was good. Afterward, he noticed that I always mentioned Almighty God whereas his mother believed in the Lord Jesus. Out of curiosity, he surfed on the internet to see what kind of church the Church of Almighty God was. Unexpectedly, he was deceived and lost direction by the overwhelming online rumors, false testimonies and words of blasphemy against Almighty God. And he began to oppose my belief in Him. But, after reading the words Almighty God expressed and listening to brothers and sisters’ fellowship and testimony, I was convinced that Almighty God is the only true God while those online words are lies and deceptions. Nevertheless, regardless of how I testified about God’s work to my husband and exhorted him, he didn’t hear anything. 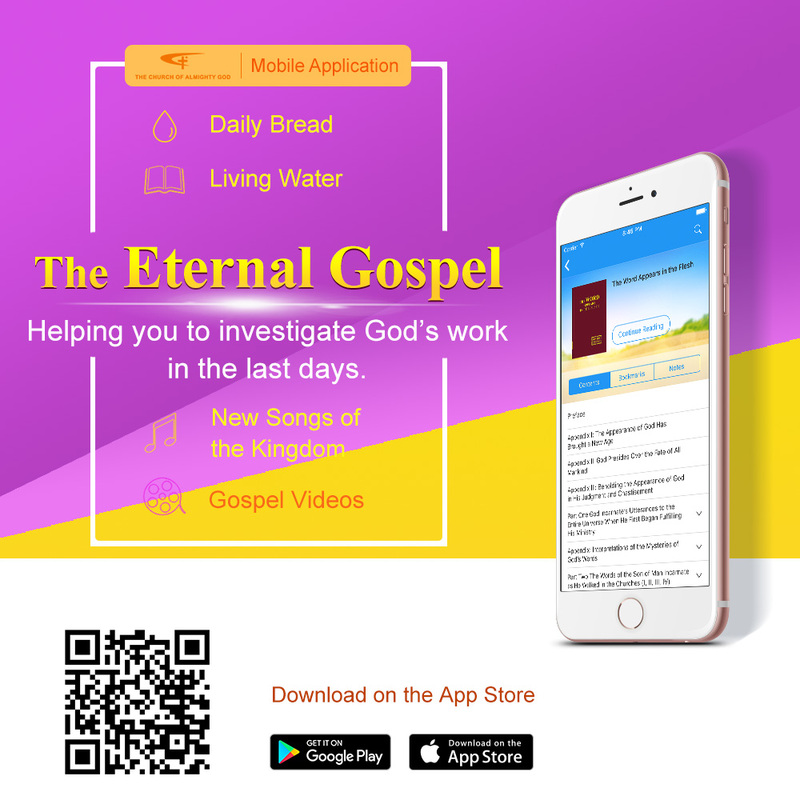 A period of time later, through the exhortation and testimony of my good friend Sister Yinghe and I for many times, my husband unwillingly agreed to investigate Almighty God’s work in the last days. Nonetheless, influenced by his mother, he held on to the Bible. To reverse his notions, Sister Yinghe advised me to watch the gospel movie “Disclose the Mystery About the Bible” with him. But I didn’t adopt her suggestion yet decided by myself to watch the movie “Break Through the Snare” with him, which disclosed the CCP and the religious antichrists’ resistance against God’s work. After watching only a part of the movie, he said, “The Church of Almighty God is attacked by the Chinese government. Might makes right. What if we are arrested after going back to Mainland China? You’d better not believe. Moreover, there’s so much disapproval on the internet. What you believe in may not be right.” I tried to persuade him to watch the whole movie, but he rebuffed it. Finding that I insisted on my belief, he got angry with me directly one day, saying, “Believe in it if you have to. But don’t tell others I’m your husband if you are arrested. I don’t want to get implicated! You put me under great pressure. If I don’t believe in the gospel, what if He is the true God? If I believe in Him, I’ll be in danger of being arrested. Besides, there’re so many negative statements on the internet. To whom should I listen?” Seeing that he toiled in suffering and despair by the online rumors, I felt that those online rumors and false testimonies were really harmful. They not only hindered man from accepting the true way, but broke up families. It seems that those who fabricated rumors and made false testimonies are purely the devil’s satanic horde. Thank God for giving me the capability to discern and keeping me from being scammed by Satan. One day, my husband came back from work. At the sight of me having a meeting, his face clouded at once and he slammed the door and went out with anger. After the supper time, he still didn’t come back and I couldn’t help but worry about him. At 8 p.m. he finally came back but was foaming with rage. I went to cook for him, but he said coldly, “Mind your own business! Since you don’t listen to me and continue your belief in God, stay out of my business from now on. I’ll only be responsible for the family’s living expenses. What I do outside has nothing to do with you. It’s none of your business that even I do something harmful to this family.” The more I thought about his words, the more distressed I felt. I couldn’t fall asleep that night. I prayed to God unceasingly, “O God! What should I do about this? May You lead me! I don’t want to leave You.” The next morning, God’s words fellowshiped in the meeting suddenly occurred to me, “In every step of work that God does within people, externally it appears to be interactions between people, as if born of human arrangements, or from human interference. But behind the scenes, every step of work, and everything that happens, is a wager made by Satan before God, and requires people to stand firm in their testimony to God. Take when Job was tried, for example: Behind the scenes, Satan was making a bet with God, and what happened to Job was the deeds of men, and the interference of men. Behind every step that God does in you is Satan’s wager with God—behind it all is a battle. … When God and Satan do battle in the spiritual realm, how should you satisfy God, and how should you stand firm in your testimony to Him? You should know that everything that happens to you is a great trial and the time when God needs you to bear testimony” (“Only Loving God Is Truly Believing in God” in The Word Appears in the Flesh). Originally, I fixated my eyes on my husband. I had thought that there are too many false matters in this world and that lies and deceptions fill everywhere. For the sake of their interests and for their own purposes, man judges and attacks others and even creates rumors to frame them and makes false testimonies to harm them. As long as those who have a good mind engage in brief reflection, they will know those online words attacking, judging and condemning Almighty God are all false and they will not be deceived. However, my husband believed in them without further thought and took them as the fact and was blinded by them. I thought it should not have been that way. But now God’s words change my viewpoint. I understand that God’s trial has come upon me, that God wants to see whether my faith in Him is true through this matter, and that He wants me to bear witness for Him in this trial. At that point, I thought of the biblical verses on divorce, and I became confident and knew how to face him. At breakfast, my husband didn’t speak anything, with a straight face. However, I felt God’s presence and didn’t worry or fear as I did in the former night. I said to him calmly, “In believing in God, I don’t do anything shameful to our family. If you intend to do something that hurts our family, it is created by you degrading yourself but not by my belief in God. The Bible says that man can’t commit adultery. God’s words also allow us to know that it’s ordained by God that two people can become a couple. But if one side has an affair, the other side can choose divorce. One who has such an infidelity not only will go to hell, but will be punished.” My words softened his tone and he said, “I said those words because you don’t take my advice and insist on your belief.” Later, my husband didn’t say anything about it. This storm receded almost as quickly as it had come. Thanks be to God! It was God’s words that gave me the courage to overcome Satan’s temptation. Nonetheless, the tranquility was illusory. One month later, my husband saw the online rumors again. One day when he came back from work, seeing me sit in front of the computer, he scolded, “I think you’re mad. After consideration, I had a solution: Either you stop your belief immediately, or we divorce. I’ve also thought about the two children. You can have their custody. But I guess it’s difficult for you to stay in Japan. So, you can go back to Shanghai with them. I’ll give the flat in Shanghai and monthly maintenance of 100,000 yen to you. If you don’t want the children, it’s OK. You can choose freely. I’ve also consulted the procedure of divorce. We just need to sign the divorce paper in City Office. Tell me your choice.” I couldn’t answer him immediately and forgot prayer as well. I only thought about what would happen after the divorce: If my children stay with me, they’ll be happy, but I don’t have enough money to raise them. If they don’t follow me, they’ll be very pitiable. What’s more, how will my parents and relatives and friends think of me? It’s glamorous to live abroad. But, if I divorce, my parents will lose face. I told him that I needed consideration. But I didn’t know how to do. Going into the room, I bawled my eyes out. I stayed awake through the night and my tears wetted the pillowcase. In the following day, my husband went to work without any word. I prayed to God for the strength to face him. When I lived in pain and was at a loss what to do, I told this matter to brothers and sisters. They encouraged and comforted me, saying that Satan’s temptation had come upon me. They asked me to learn to rely on God and not to lose faith or misunderstand God. They shared the testimonies of experiences of other brothers and sisters and said that God is a God who saves man and that He doesn’t break up man’s family or want man to divorce, and that only Satan gives man distress and destroys man’s relations. They read a passage of Almighty God’s words for me, “When people have yet to be saved, their lives are often interfered with, and even controlled by, Satan. In other words, people who have not been saved are prisoners to Satan, they have no freedom, they have not been relinquished by Satan, they are not qualified or entitled to worship God, and they are closely pursued and viciously attacked by Satan. Such people have no happiness to speak of, they have no right to a normal existence to speak of, and moreover they have no dignity to speak of. Only if you stand up and do battle with Satan, using your faith in God and obedience to, and fear of God as the weapons with which to fight a life-and-death battle with Satan, such that you fully defeat Satan and cause it to turn tail and become cowardly whenever it sees you, so that it completely abandons its attacks and accusations against you—only then will you be saved and become free” (“God’s Work, God’s Disposition, and God Himself II” in Continuation of The Word Appears in the Flesh). God’s words made me understand that before I believed in God, I completely lived under Satan’s domain and I was Satan’s toy and slave, and that after I believed in God, I came before God from Satan’s camp. This means a betrayal of Satan. So, Satan is unwilling to admit defeat and uses my husband to attack and threaten me so as to make me give up my belief. I worry that after divorce, my children will be affected, people in my hometown will think ill of me, my parents will be looked down upon by the neighbors. All these thoughts are from Satan. If I am controlled by them, I will be controlled by Satan, eventually staying away from God, even denying Him, and going back to Satan’s camp. Satan is too contemptible and hateful. It is positive, right and proper for me to believe in God and worship the Creator. No one has the right to intervene. But Satan wants to control me. I know I lack enough confidence but I am willing to depend on God’s words to take the way ahead and not to yield to Satan. At the thought of that, my uneasy heart finally calmed down. Later, brothers and sisters shared another passage of God’s words with me, “Without God’s permission, it is difficult for Satan to touch even a drop of water or grain of sand upon the land; without God’s permission, Satan is not even free to move the ants about upon the land—let alone mankind, who was created by God. In the eyes of God, Satan is inferior to the lilies on the mountain, to the birds flying in the air, to the fish in the sea, and to the maggots on the earth. 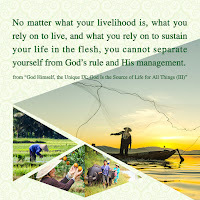 Its role among all things is to serve all things, and work for mankind, and serve God’s work and His plan of management. Regardless of how malicious its nature, and how evil its substance, the only thing it can do is to dutifully abide by its function: being of service to God, and providing a counterpoint to God. Such is the essence and position of Satan. Its substance is unconnected to life, unconnected to power, unconnected to authority; it is merely a plaything in God’s hands, just a machine in service to God!” (“God Himself, the Unique I” in Continuation of The Word Appears in the Flesh). From God’s words, I understood that God is the One who possesses the supreme authority, that God controls all things among the heavens and the earth, and that everything of man is in God’s hand. Man’s marriage and family rests in God’s palm. Without God’s permission, Satan can do nothing. Whether I get divorced or not is ruled and predestined by God rather than decided by my husband. I want to obey God’s sovereignty and arrangement. Some unbelievers divorce due to money, some due to an affair, and some due to a rupture of affections. If I get divorced because I choose to believe in God, pursue the truth, and pursue to live out a meaningful life, this is an honor, not a shame. At that time, I thought of God’s words, “Faith is a single-plank bridge: Whoever fears death will have a hard time crossing it, and whoever gives up their life will cross it securely. When man has the thought of timidity and fear, it is the fooling of Satan. It fears that we might pass the bridge of faith into God. Satan always tries every possible means to give you thoughts. Beseech God to illuminate and enlighten us at any time, rely on God to cleanse the satanic poisons within us at any time, and exercise to draw near to God in spirit at any time, letting God rule over and occupy our whole being” (“The Sixth Utterance” in The Word Appears in the Flesh). God’s words granted me strength and faith, so that I had the courage to face my husband. Yes. I should hold nothing back. No matter how the future way is, it is right for me to take the way of believing in God. At night when my husband came back, I told him in a simple and direct way, “It’s impossible for me not to believe in Almighty God. If you want to divorce, do as you like.” He was somewhat dumbfounded, saying helplessly, “It seems that I don’t have any control over you. There’re so many opposing views on the internet, so if I don’t handle you and something happens to you one day, I’ll have to take the responsibility. But now I use the divorce to threaten you yet you don’t abandon your belief. If you get into troubles on account of your belief and your mother knows it, don’t shift the blame to me.” From then on, my husband washed his hands of my belief. Miraculously, our relations were restored and he never mentioned the divorce. Later, once my small daughter and I both caught cold. It was raining. But, my big daughter needed to take practices outside. So, I had to pull my tired body to accompany her with my little daughter. When my husband came back and knew the situation, he said, “Luxi, you did a lot of work. I find that you’ve changed. You love the children all the more and become very diligent.” Hearing his words, I deeply knew that it is Almighty God who changed me. I have God’s words as the basis and have the direction of life, so I no longer get angry with my children casually or only live for enjoyment. Gradually, I found that my husband also changed. Before, he always thought he was right. Now when he deals with some matters, he will ask me for advice and practice being an honest person according to God’s requirements I have told him. And he even testifies about God’s authority and sovereignty to his friends. Thank God for orchestrating all this to me, so that I have experienced God’s words and understood many truths. I have seen that Satan is very contemptible, doing everything possible to cause man to leave God and become its plunder and be devoured by it, while God rules over all things and orchestrates everything. Without God’s permission, Satan can do nothing and even can’t touch a single hair of ours. As long as we have faith and believe in God’s words and live by God’s words, we can break through Satan’s influence of darkness, stand the testimony for God and let God gain the glory. I have also seen that the online rumors and false testimonies will never stand. Time will prove everything and the fact will show everything. God’s sheep hear God’s voice. Regardless of how great Satan’s hindrance is, they will surely come before God in the end. This can’t be hindered by any force of Satan. May all the glory go to Almighty God!